Sony has released Three fantastic new High Power Audio Systems to power a proper party in 2018. With three options of the All-In-One box style; MHC-V81D, MHC-V71D and MHC-V41D will fill any room with booming sounds. These models have been introduced in the market keeping in mind the growing demand of One Box Style Audio System. Customers will now get more option to choose from at various price points. The new TAIKO mode, as the name suggests in Japanese, allows one to use their High Power Audio One-Box System like a drum. User can add twist to their favourite songs by tapping the Touch Panel and enjoy the sounds of a variety of drum samplers, or tap to the rhythm and compete with friends for the highest score. In the spirit of competition, one can also challenge their friends to see who can party most to win the “Party King” title. Get the party off to a fiery start with stunning guitar skills! The new guitar input mode3 takes guitar playing to the next level with the revolutionary capability of generating guitar overdrive sound effects without the use of a professional guitar amplifier. The user can plug bass guitar into the High Power Audio system to boost the bass and produce awesome sounds. All the High Power Audio one-box systems come with unique attribute such as gesture control feature that enables one to be the DJ with a wave of a hand. The audio system is also enabled with Digital Sound Enhancement Engine (DSEE) which helps boost the quality of any compressed music files. These one box style High Power Audio systems spread loud and powerful sounds around the room, thanks to the integrated spread sound generator. In addition, MHC-V81D dustproof and its top surface issplashproof along with a 360˚ LIVE SOUND. The MHC-V71D is equipped with LIVE SOUND feature for high quality music output. They will be the center of any party space as the MHC-V71D and MHC-V81D models have flashy 360˚ party lights that illuminate the room crafting the perfect party atmosphere. 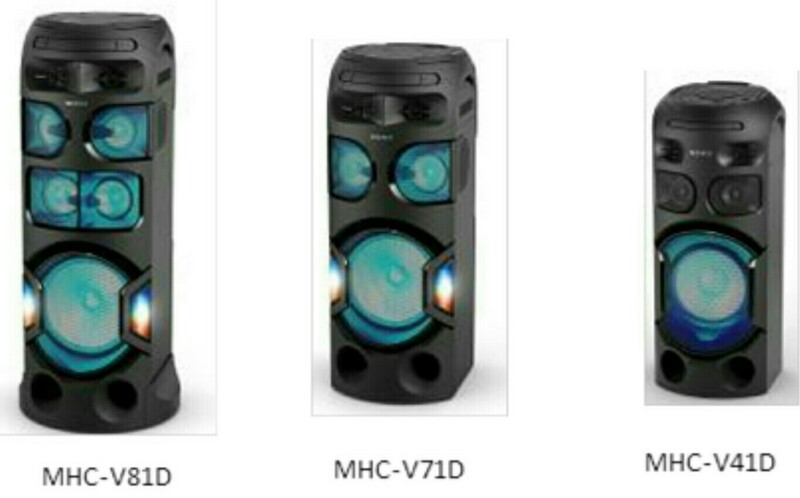 With affordable MHC-V41D audio system, one can turn the house into a nightclub as it has the ability to sync speaker lights with the beat of the music for a real club atmosphere. With additional 2x tweeters, MHC-V81D is able to achieve 360˚ sound field. Even sound from the back of the unit is similar level of dB sufficient frequency for bass sound. MHC-V81D, MHC-V71D and MHC-V41D have the ability to bring the whole party together with its unique interactive features that gets everyone involved. With the accompanying “Fiestable” app, user can easily control party features. DJ Control; user can control, DJ effect (Isolator/Flanger/Wah/Pan), Sampler (Drums/Voice/etc. ), and EQ. Also user can manage illumination of those models. Connect Sound as well as friends with the Wireless Party Chain via Bluetooth® feature which can now connect up to 50 compatible systems together. User can also have multi device connectivity so the power of the DJ can be passed around by connecting several smartphones to the speaker allowing different members of the party to play their favourite song easily. All the three High Power Audio systems are enabled with NFC for seamless streaming. The LDAC™ helps to send approximately three times more data than conventional Bluetooth® audio for a superior wireless listening experience. The Music Center app lets one control music and sound settings right from the phone. The Fiestable plug in puts the user in charge of light colours and enables one to activate DJ and karaoke modes. Make changes with a flick of the wrist with intuitive motion control. The unique design of these audio systems helps to achieve effortless portability in the living room. The wheels and handle bar make it easy to move around, making it the perfect addition to any party. The systems are also embedded with an option for built in DVD/CD player and HDMI output. These High Power Audio systems will be available across all Sony Center and Major Electronic Stores in India.